Summer in Jerez….and there are already lots of visitors. On my most recent visit I heard German, English, French and something Scandinavian too, which is good news for the town. 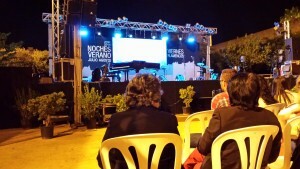 The Noches de Verano programme, of cultural events in historic and scenic venues, has been announced. 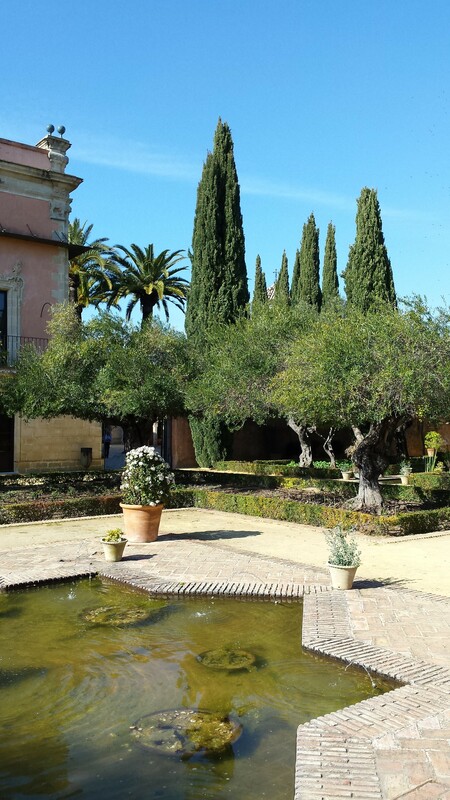 This is a wonderful way to use beautiful, old spaces, like the 13th century monastery of San Domingo – I heard a magical classical concert there a couple of years ago, Mendelsson echoing as a full moon rose above the cloisters. In the ancient Alcazar I saw flamenco – there is usually flamenco on Fridays – but the stage there has lots of different artists – a Queen tribute band could be heard Radio Ga-ga-ing way beyond the old twelfth century walls last Summer. And Plaza Ascuncion, a beautiful square containing the neo-classical old town hall, the mudejar church of San Dionysio and a grand palacio, was where I watched a company of dancers only just over a year ago. 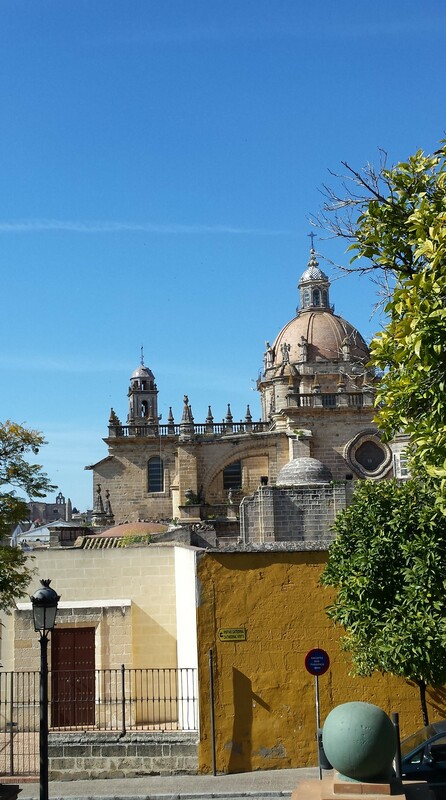 There is always something to see, and listen to, in Jerez. 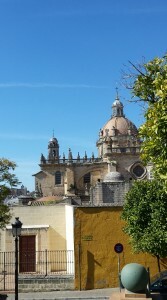 One change since my previous visit is that Jerez now has a local government, albeit a minority one. The PP has taken office, on the basis that they garnered the most votes in the recent local elections (34%). The other parties, together, gained considerably more votes – PSOE got 24% , Ganemos (what Podemos calls itself in these parts) 16% and other, left-leaning parties 7% (with the Citizen’s party gaining almost 9%). But, the parties of the left having failed to form an alliance, the PP are in power. For how long and with what functioning remit remains to be seen. I had a quiet time, sketching out the narratives which will form the basis of another year in my Village. It took me two years to write The Village, though I was learning as I went along. I hope it won’t take quite so long to write the next one. The positive comments (and reviews) from readers have been really encouraging and I’m told that folk want to read more about the village characters – to know how Molly is getting along, what’s happening at the Library and how the village absorbs the impact of the accident. This has prompted me to write about the village again rather sooner than I had planned. But I will be working on the next set of stories for some while to come, I think, they need to be at least as good as the first set. One of the places in Jerez where I like to sit and think, jotting down potential ideas, is the 12th century Alcazar, in gardens where fountains burble in the shade of cypress trees. There are tourists wandering around, but the place is never crowded and I always get lots done, watched over by the thirteenth century King Alfonso X (see below). He was a remarkable monarch. Called ‘El Sabio’ – ‘The Wise’ – he was the son of a famous warrior King, who had much success in pushing back the Moors from central Iberia. 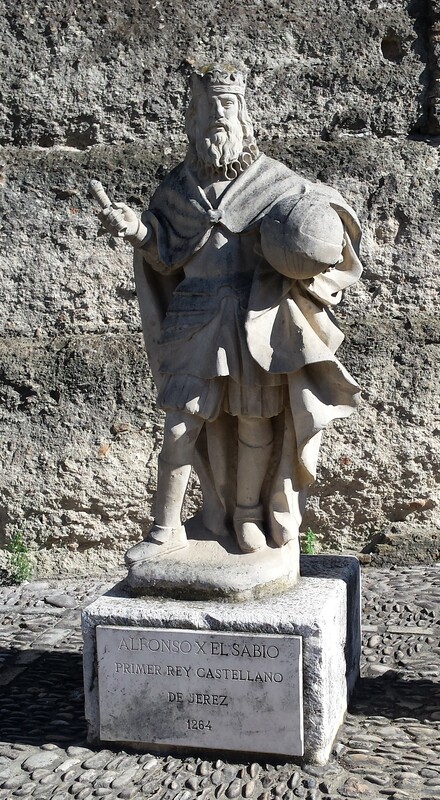 Alfonso was brought up in multi-cultural and sophisticated Toledo and, throughout his life, surrounded himself with Jewish, Muslim and Christian scholars. Though he had some martial successes, his legacy is of a different kind. He formulated the Siete Partidos and Fueros a system of laws which devolved some governing powers to cities (thereby restraining the ambitions of his barons). Giving citizens some say in their government was a fairly revolutionary thing for a monarch to do at the time – the English Magna Carta, signed in 1215 by King John, gave rights to barons only. The system was imported into the Americas following Colombus and, later, in a completely different form, into U.S. governance. So Alfonso X is honoured by another statue, in the U.S. House of Representatives, as ‘The Law-giver’. But he has an even more amazing monument. Alfonso was a keen astronomer. When the Christian armies finally overran much of Al Andalus, he ensured that the works of important Moorish astronomers were saved and circulated, commissioning the Alfonsine tables. This allowed western cosmology and astronomy to develop towards Copernicus and Galileo. His memorial for this can be found on the Moon, where craterus Alfonsus bears his name. Incidentally, while doing all this and expanding his own domains by over a third, he managed to co-author the first book about games and gaming in the western world, as well as being an accomplished poet and musician. An interesting king, little known outside Spain and the Americas, I think he should be known more widely.